My source was Nancy Ridenour, of Lotus Studios, who is a keen gardener with an impressive lotus pond had generously given us access. Armed with a pair of borrowed galoshes and a retractable pole to which I’d attached a hook, I approached the pond convinced I’d soon be sliding down the slippery, slimy embankment. The buds and blooms always seemed that one extra tantalizing inch out of reach! Pristine, serene and elegant the flower atop its tall, tensile stem, seems afloat above the murky surface below. For Hindus and Buddhists this image is richly imbued with symbolism: purity of mind and body, detachment from corrupting desires and influences, unsullied by surrounding detritus, ideals of virtue and aesthetic perfection –the list is as long as the stretch of our imagination. In more prosaic terms, where the plant is native –all parts of the lotus, from roots to stems, buds, blooms and seeds — are edible, and of great culinary delight. The flower provides a base for perfume and healing oils while the roots, stem and seeds have served medicinal purposes—reducing fevers, curing diarrhoea, staunching bleeding, calming troubled minds. 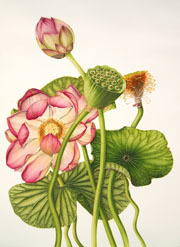 In poetry, song, art and sculpture the lotus has enduring evocative power. Since the plant simultaneously bears buds, flowers and seeds, it has come to represent both immortality as well as the concept of timelessness containing past, present and future. One exceptional feature of N. nucifera is its capacity for thermoregulation — its flowers heat to 85 degrees plus, even when the surrounding air temperature is a cool 50 degrees. The heated air releases aromas that attract pollinators to continue the cycle of regeneration. A truly sacred plant, indeed!